Allan and Val Orr are the founders of Aspect Productivity Technology. Allan originally trained as an electrician and developed the original business into an automation company called Ecom Systems. In 1990 an Auckland blow and injection moulding company approached Allan to help digitise their production floor. They wanted to stop using manual systems (like clipboards) and get production and performance data directly from their production machines and into a computer. What the client wanted was live data rather than a historical representation of machine data. They also wanted to have that data available for multiple users to enable accurate business planning. Allan designed a method of getting the data directly from the plant PLC into a relational database which was installed at the plant. Allan named this software AspectPL. Next, Allan and his team developed features for scheduling, measuring OEE (overall equipment effectiveness), accounting for rejects and traceability of product. In 1996 Ecom Systems went international. An Australasian multinational plastics manufacturer installed AspectPL in their Auckland plant. Their head office in Melbourne was initiating ‘lean manufacturing’ across their plants and noticed the efficiencies AspectPL was enabling in Auckland. 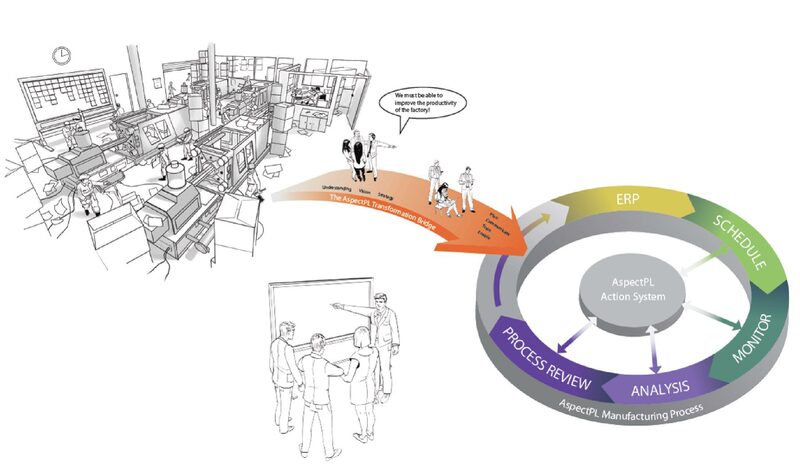 They viewed AspectPL as a tool to assist their lean manufacturing programme and installed AspectPL throughout their plants in New Zealand, Australia and China. AspectPL is still providing visibility and enabling efficiencies to these operations today. In 2000 Ecom Systems became Production Logistics. Over the next 9 years, both financial and technology investment in AspectPL continued. The software was developed to support integrated production and inventory systems such as MRP and ERP – based on American standard ISA-95. In June 2009 Production Logistics was split and a new company – Aspect Productivity Technology – was formed. Two new investors were also bought in to support the technical development and continue commercialising AspectPL. Since then Aspect Productivity Technology has built market share leadership in New Zealand and Australia. AspectPL is always developing and evolving. It continues to help businesses digitise their production facility, allowing paperless manufacturing and offering seamless ERP system integration.